Let me get this out of the way first thing, because there have been too many people saying it looks too much like Far Cry. While there are some similarities, they are very superficial. The over all experience is light years away from what Far Cry was. Read on to learn what I mean. 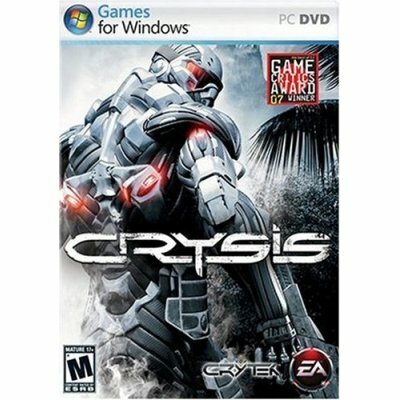 It should also be worth noting that every one here in Impulse Gamer U.S location all enjoyed Crysis for different reasons, and the game allows for several different gaming styles. From the cautious recon style gamer, to the let’s blow crap up and bring them on style of gamer. Thumbs up from all of us Here, Myself, Donna and Shael. Winning Donna Millheim over was a real feat unto itself because she is hard to please when it comes to her gaming. Crysis was long in coming, the hype machine keeping us all frothing at the mouth. Oohing and ahhing every time we saw a sneak peek screen shot or concept art, now the time is here! Does it live up to the mind bending frenzy the marketing guys and gals brought upon us? Yes and no in many respects. Thankfully no one coined up the frenzy on par with a certain franchise that made it sound like a second coming. Nothing could live up to that hype. Crysis delivers a lot though, and there was an obvious attention to some detail in varying degrees. It’s no secret by now that there is a three act structure that rockets the player along in the story and in the battles, constantly tweaking the unique bio suit on the fly and in real time for what ever task may be set before the player. Later in the game even the environment and weather become a threat that the player has to contend with, this is a very welcome thing, even with odd weather patterns it throws a refreshing twist to First Person Shooters. The CryENGINE 2, engine delivers a pretty awesome experience, even without direct X10. The game engine graphics are some of the most realistic environments to date in a game. To use the phrase spectacular special effects does not really do the game justice. The surroundings are so darn realistic you would swear your playing what could almost be a video feed from a real tropical island. Combined with some pretty dead bang physics and lighting make this an incredible gaming experience. Who knew shooting vegetation, palm trees or circling seagulls could be so much fun? If you happen to be running XP, the game limits the in game settings to the High quality, while Windows Vista can go up to Very High quality graphics settings. Either setting looks darn good, players should not feel slighted in the least running XP as apposed to Vista. The tools of a really fun FPS and Multiplayer game are all here. Imagine playing with up to 32 players in a multiplayer slug fest, with real time armor tweaking and weapons customizing. Now throw in some other toys as well such as the ever cool vehicles to control, land, sea or air. While the air vehicles are not exactly easy to control they sure are cool. To aid in multi player destruction and lend your buddies a hand, some game stores even had a pre order special going where you can also get a amphibious Personnel Carrier. This eight wheeled bad boy is at home on land or sea! Sporting a six player capacity plus the driver, it’s not without some teeth. It can fire anti armor rounds and armor piercing missiles and can chug along at 40 miles per hour! 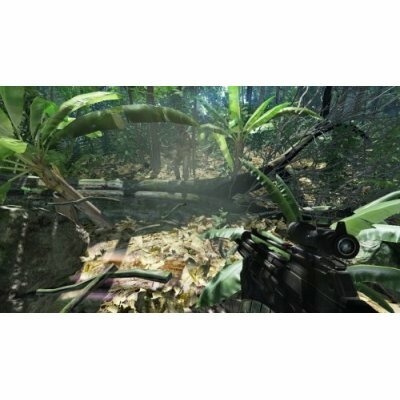 Crysis comes across in some minor ways like a FPS with undertones of an RPG adventure. The adventure keeps the player interested with constant situations and the need to find out what the heck is going on. The mission starts out simple enough but of course like any really cool action movie involving Special Forces, the mission turns out to be more than any one bargained for. Not to worry though because the player character is equipped with a wicked cool nano suit that enhances the wearer’s abilities. These special 'enhancements' include speed, strength, increased armor and invisibility cloaking; and the player will need them all to survive. AI does a pretty good job of converging on your last known position, and soldiers even fire off a flare to call in re enforcements to really give the player some trouble. Like most good soldiers they have some basic body armor, so sometimes more than one shot is required to take the enemy out. When in doubt, head shot puts the enemy down for a dirt nap pretty darn quick. Voice acting is such that I really was not thinking about the lines at all, that’s when it’s good. Voice actors did a very fine job of bringing the characters to life. Sounds in the game are as expected with such a fine adventure to live up to. Gun fire is satisfying; grenades and other explosions sound satisfyingly teeth rattling. Ambient sounds also lends well to the game. Subtle things such as foot falls crunching in the sand, birds in the distance or insects all around you all bring the world to life on so many levels. Add the music that seems to play in such a way that it’s there but not intrusive to the experience. The design team orchestrated all the parts perfectly. Controls are the standard fare keyboard and mouse setup for most FPS games, and just like a good game and control design the controls can be customized by using the setup menu from the main menu. To be able to save your own game with several single player games going on in the house hold, make sure you create a user profile and save once in a while under your name. Later you can load profiles and get back to your game with out messing any of your other gamer’s progress up. In game the head’s up display is pretty easy to get used to since so many other FPS games have one in one various form or another. The tactical radar and threat gauges took a bit of getting used to, but players will soon find that it is an essential tool for surviving in the game. The Nano Suit has a couple of very welcome features, one of these is a sort of Aqualung that engages automatically if the player submerges, be careful because it’s for a limited time only. There is also a built in night vision mode, but it quickly drains, so players may not find too much use for it. We can go on and on, rehash what has already been said and said again. Bottom line is the game fun and does it have some shelf life? Yes, with a resounding yes. The folks at Crytek and Electronic Arts get a big nod from Impulse Gamer for not shirking on either the single player experience, or the multiplayer. Speaking of the multi player experience, the ultra cool exclusives in a multiplayer game ensures some intense online gaming. Some weapons are only available in multiplayer. Live a little and try out the Molecular Accelerator on an enemy in multiplayer. This thing converts moisture in the air into razor sharp ice shards that is then fired at a target and perforates them in style. 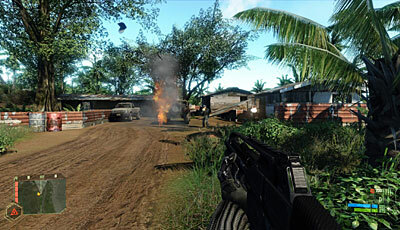 Crysis is the PC game to have. If you have the computer power to even enjoy this at a lower graphic setting, you have got to check this out. If you have the computer power to let it all hang out, it is a crime against gaming if you do not at least test drive the demo. Sit back, relax, let’s play! Good, bad, it’s all in the fun.